In Prague 31 July 2018 - Before the first tones of the ceremonial opening concert of the Dvořák Prague Festival will be heard in Rudolfinum, his organizers invite him to another discovering musical journey along the footsteps of a great composer. On Sunday, September 2, the first time we will visit Antonín Dvořák's personal life in Prague's places of interest for the artistic career. A total of four musical stops will bring festival fans to the places where Dvořák studied, stayed and concerted. The concerts will be complemented by the dedicated and lively interpretation of the festival musicologist David Beveridge. The first stop is the flat of architect and patron Josef Hlávka in Vodičkova Street, where Dvořák was a frequent and welcoming guest. The atmosphere of home music will be reminded by the Bennewitz Quartet. Next steps will lead to the picturesque church of St. Vojtěch, where Dvorak used to become an organ in his youth. There is a selection of Biblical songs and a part of the Lužanská Mass in the hands of the Prague Mixed Corps. The third stop will be the breathtaking Art Nouveau seat of the Singer Hlahol Society, with whom Dvorak worked closely in his life. In addition, it is under the supervision of Zofin, a place where the master personally premiered a number of his works. In Hlood, his choral compositions are performed by Kühn's mixed choir. The Prague wandering will be finished in Konvikt, where the organ school was in the past and young Dvorak studied here for the first two years after coming to Prague. The violinist Jiří Vodička and the pianist Martin Kasik will perform his favorite compositions for violin and piano not only from Dvořák's legacy but also from the work of his friend and adviser Johannes Brahms. At individual concerts, tickets can be purchased separately or tickets for all four concerts can be purchased at a discounted price of CZK 500. More information and ticket sales at www.dvorakovapraha.cz . Antonin Dvorak was born in Nelahozeves, he loved the villa at Vysoké, he liked to travel, he loved England and fascinated America. But the center of his world was Prague. He studied here since 1857, started his career here, and has experienced key meetings of his life here. As an instrument used with the violin in the orchestra of the Provisional Theater, as a renowned composer, he conducts historically the first concert of the Czech Philharmonic Orchestra. He meets here with his donors, builder and philanthropist Josef Hlávka or later brother-in-law, Count Kounic. From here, he goes on triumphant journeys around the world and returns with humility. In Prague he marries, experiences moments of family happiness and tragic loss, and in Prague he died on May 1, 1904. 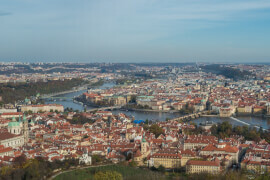 Trip In the footsteps of AD, it is a fixed part of the Dvořák Prague program since 2013 and in the past the festival visitor could visit Luzany, Central Bohemia, Vysoká u Příbram, Nelahozeves and Kromeriz.